Nestled in the Pyrénées, this charming old city enjoys a beautiful location. The hilltop city of Pau, complete with a noble château, became popular with upper-class British visitors in the 19th century. The well-bred and well-to-do came to enjoy Pau's temperate climate and panoramic views of the Pyrénées in the distance. They built grand villas to accommodate them in the style to which they were accustomed, and a casino to tempt fate. Pau retains the air and ambience of a dignified retreat, even with its modernized facilities and updated outlook. 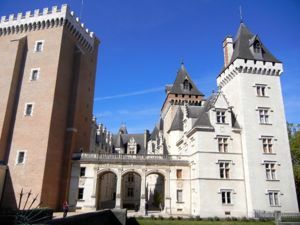 It's a great place to get away from tourist crowds for a day or two of living à la française without the bustle of Biarritz, Lourdes or Sarlat. Pau is just 195 kilometers (121 miles) from Toulouse, or about a two-hour drive. Above, Château de Pau, France.